Chrichton's World: Review Sigaw a.k.a. The Echo (2004): Incredibly bad! Review Sigaw a.k.a. 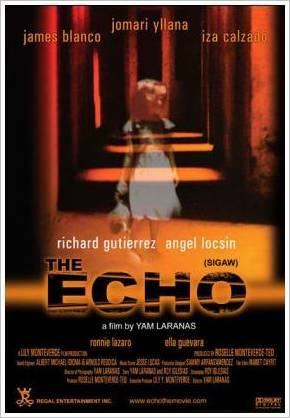 The Echo (2004): Incredibly bad! Within 8 minutes you can figure out what is going on. But it takes the director almost forever (85 minutes) to reveal the story officially to the viewer as if someone still hasn't a clue by then even when a certain event gets repeated over and over again. And if there had been some twist at the end or something else to compensate than I could have forgiven the director for this mistake. Sadly there aren't any surprises to be found in this movie. Sigaw started out pretty good by building a tense atmosphere only to ruin it with loud sound effects. The main character early on hears but also sees things. And this is the part that doesn't make sense. The place he lives is in a dump. Apparently he is one of the few people who are staying in the building. All the other tenants have fled. Still he refuses to leave his precious unit. Why? That never gets explained. (Well, he mentions he has bought the unit. But somehow this reason doesn't convince me enough since he has a very sweet mother who wants him to return to his old home.) It would have created some sympathy towards this character if we understood why it is so necessary for him to stay. Now he just seems very stupid who has an even more stupid (but good looking) girlfriend called Pinky who does things a normal person in their position never would do. The whole time we have to endure the lack of real thrilling moments combined with the stupid actions of these characters. If you managed to stay awake till the ending than you'll find out that there is no reward for doing so since the ending is complete abysmal and the most stupid of endings I have ever seen. I hate to say it but there is nothing that Sigaw offers that is worth watching. Waste of time!